Figure I might as well make an introductory post before I start asking questions. Over the weekend I picked up an '83 CB650SC Nighthawk. I got it for cheap but needs a little work. The guy I bought it from said the engine had a knock and included a parts bike that has a running engine, same year and size. Should be a fairly straightforward deal but being my first bike there are things that I'm figuring out. There were some parts already removed from the bike and put in a box so I will be asking for help there as well. All in all it's in pretty good shape, just needs cleaned up and of course swapping the engine. I am 23 from Indiana and this is my first motorcycle. I have several project cars I'm working on so I'm no stranger to working on these types of things. The plan with this bike is to simply fix it up and get it running so I can learn to ride, then use it as my daily when it's nice out. I only have one picture right now but I will get better ones once it's fixed up and going. Hopefully that's not too far in the future. welcome. This site is for the older sohc4 650's but still some knowledge here. A few of the dohc4 members here too. It looks like the seat on your bike is off a older bike. Everything CB650 said above is correct. 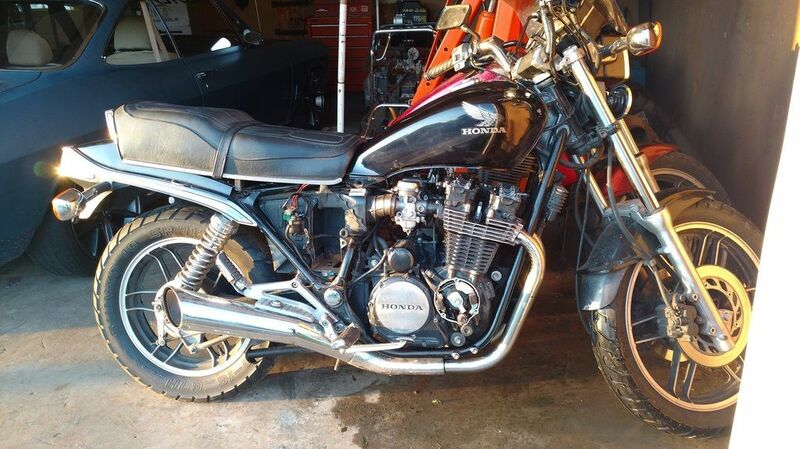 There are major differences between the 1983 Nighthawk 650 and all other years of the CB650. Feel free to ask anything, and we will try to help you out when we can. Thanks​ for the heads up. Is there a forum that would better suit me then? Only other one I could find was the Nighthawk forum.